Chris and I go way back. We only live a few miles apart and I was one of his instructors in his early years. He studies the martial arts in great depth and his writing seems to effortlessly communicate what are often very profound concepts. This two part article is a great read on the principles of karate that I'm sure you'll all enjoy. I'm very grateful to Chris for sharing this with us all. In part 1 of this article, we discussed in depth about the idea and importance of principle based training. Now we will expand this idea further, answer some of the questions that have already been naturally raised and explain how this strategy can be implemented into your everyday training. 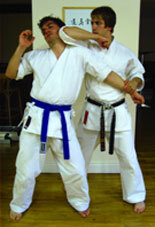 All of the genuine training in karate is derived from the kata. If we look more closely at the fundamental techniques in karate, it is my suggestion that these are essentially a physical method of being able to repetitively develop the principles contained within them. The key here lies in the principles rather than the actual techniques. I like to think of our common basic techniques as being the founder's way of best expressing those principles in 'formal' action. Remember that without a physical technique to exist in, principles hold no form at all. We have to think about what's inside the technique in order to make the repetitive training of it worthwhile, since many of these don't (at face value) indicate any strong practical benefits. For instance, who in their right mind would ever use the technique of junzuki (as it's commonly performed and understood in kihon) in a live fight? Only the most brave or brainless I'd expect! But let me ask you this question in another way - how many individuals would use the principles gained from practising the technique of junzuki in a live fight? If you study the concepts contained in this seemingly impractical technique, a whole range of useful elements can be extracted and adapted to increase your overall ability to apply functional movements. This is of course only if you have an open mind. In reality, this is exactly what karate demands and is what I believe makes the art so special. Among other things, practising junzuki repetitively and with the right mind (one that assesses principles) can actually teach us about balance, co-ordination, weight distribution, movement, creating energy, transferring energy, stabilisation and efficient motion, which I'm sure you'll agree are critical in becoming proficient in self defence. It no longer has to be another 'boring technique used only to pass grade examinations'. Just by changing your thought process and methodology, junzuki has become a technique with extremely beneficial characteristics. Not only that though, you are also now able to see this and adapt the lessons learned in other aspects. Fig 4a & b: The classical technique of 'Junzuki', along with a typical adaptable application, which incorporates the principles learned in kihon. As an example of this and to extract yet another principle from Junzuki, I would like to look at the very common motion of hikite (pulling hand). Over the years, this movement has been literally scolded by the uneducated, in sharing the common sense argument that pulling the hand back to the waist in a 'real' combat confrontation would simply be suicide. To start with, I completely agree with this statement and I will raise my hand and admit to holding the very same view before my engagement into more committed research. Most of us who choose to look a little deeper now understand that the practice of hikite in kata or kihon can be viewed as a 'repetitive training method'. By constantly practising the motion of hikite, we are being physically conditioned and reminded of the fact that there is a large advantage to seizing and pulling an attackers limb, in order to control, nullify the potential hazards, obtain clear strike paths, create reference points or increase the net effect of your transmitted power. This is only applicable of course, if you physically train with this concept in mind. Otherwise, the practice of hikite as a discrete technique alone will still reduce it to a practically useless motion. Nevertheless, hikite in one form or another can be found extensively in all martial arts that serve to improve any form of practical combat function. Wing Chun, Tai Chi, Kali, Jujutsu, Aikido, Ninjutsu to name but a few, all apply a similar approach in their fighting strategies. Karate is certainly no different. The close fighting distance (Maii) we are faced with during a real physical encounter severely limits our ability to respond to visual stimuli. In these situations we have to utilise our tactile awareness and responses further. This is where hikite can help tremendously. This shows that how we think about certain aspects of the motions (by breaking techniques down) will greatly influence our individual progress and positive interpretation of all our techniques in karate. Fig 5: The use of 'Hikite' to ensure that both upper limbs are used positively. By looking at the concepts behind a particular technique, we can start to create the ability to use them elsewhere, in a much more fluid way. The 'hikite' example above for instance, is a great illustration. How simple is it to add a pulling action to your in-fighting repertoire? The technique is so versatile that it can be used almost anywhere. Why do you think that 90% + of karate techniques employ this type of double action with the limbs? 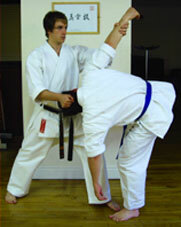 This is however only one example of a common principle in karate. There are a great many more however, which cater for various different physical and mental elements. When studying kata bunkai (the analysis of the forms), it's imperative to pay particular attention to how the body moves during a specific technique or sequence. Analysing the forms effectively and in line with the underlying principles of the art will take your focus away from the actual techniques performed strictly as part of the kata (ohyo) and enable you to express the concepts learned in many other ways (henka). As an example, if a particular technique in a kata applies a hooking strike against a double grab for instance, what would you do in a realistic situation if your opponent becomes too close for the technique to work effectively? The answer would undoubtedly be to modify your technique accordingly (therefore bending with the winds of adversity). If the opponent becomes closer than your initial technique will allow for, it would prove far more effective to use a shorter-range technique such as an elbow strike. In this case however, the body mechanics (or principles) remain exactly the same, only your choice of 'artillery' would differ to accommodate that specific situation. This is still very much within the realms of the kata theory (since the application of the 'motion' is identical) and shows a useful product of sound, open-minded bunkai. By simply equating to the hooking strike itself as shown in the form, you are severely limiting the effectiveness and efficiency of the general movement in an 'adaptable' combat situation. When teaching this notion more recently, one of my students expressed this really well by saying that it's like "putting different sized bullets into the same gun". I didn't want to steal this excellent quote, so thanks Dave. Fig 6a, b, c & d: Adapting identical body mechanics for varying situations -'putting different bullets into the same gun'. This way of thinking can be applied to any movement within the kata. Likewise, it also helps to ascertain the very important notion of a single technique being applied in a variety of different ways. This is extremely desirable in a 'live' situation, since the presence of increased adrenaline will seriously hamper the ability of your mind to scrutinise many techniques in order to find the correct one. By equating to the broader (gross) motions, you can adapt many different applications around a more 'manageable' number of general body mechanics. If we practically analyse the movement of 'soto ude uke' for instance (commonly referred to as 'outer forearm block'), we can generate many more diverse applications. 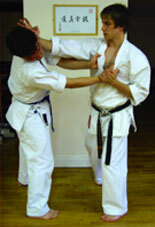 In 'modern' dojo, the technique is taught as a simple block against a middle level punch. If we look at the actual body motion however, which is to move your arm from the inside to the outside of your body (wado ryu version), a whole new level of understanding can be gained. Consequentially, soto ude uke can also be used as a strike, a choke, a hair pull, a wrist manipulation or to hyper-extend the opponents arm. This is by no means a comprehensive list of applications, rather an indication of just how diverse one simple motion in karate can be. This is of course, if you decide to take off the blinkers and think outside the box. The labels given to each technique in karate has caused a great deal of fundamental confusion. Most if not all of the terminology we use today, is primarily based on Anko Itosu's 'modification' to karate for its inclusion in the Okinawan education system in the early part of the twentieth century. It is known that Itosu altered various movements in karate to make them both easier and safer to be taught to youths and the mass public. We know that certain movements in the original kata were modified, the pinan kata were constructed and that many of the original hand positions were changed to the all too common fist (seiken). In addition, it's a comfortable assumption that the 'modern' techniques taught were given names, relating to the 'safer' applications that Itosu would have led his younger students to believe were applicable. When you look closely, I believe that the way he done this was quite ingenious indeed. We cannot forget the fact that Itosu was a well-respected and capable karate master. I doubt very much that he would have altered the system in such a way so that any practical application could not be re-generated, since above all else, karate is first and foremost perceived as a civilian fighting system. To make karate available to the masses and for the art to survive into the future, its intent would have needed this shift to become safer and more generally accepted. Itosu was the pioneer of this process and completed his intentions successfully. On the other hand, I think to alter karate so much that its original purpose could possibly be lost forever would have been a notion simply unacceptable to someone like Itosu. The true applications for any movement will undoubtedly become well hidden when your thoughts are simply directed elsewhere or you are taught a completely different way of expressing a technique. Itosu obviously knew this very well and used it to great effect when 'disguising' the more devastating movements and principles. Fig 7a, b, c & d: A number of applications to demonstrate the 'adaptability' of the single technique 'soto ude uke'. Note that both upper limbs are always 'live'. The term 'soto ude uke' is commonly defined as 'outer forearm block', however as we have just seen, the movement itself can be expressed in many more ways than a simple block. In actuality, the word 'uke' does not mean block. 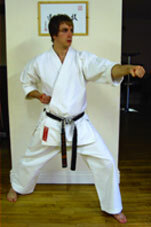 In aikido circles for instance, the word is used to describe the receiver of a particular technique. A more thorough meaning for the word would be 'response'. Therefore, calling the technique an 'outer forearm response' opens up the mind to the realisation that the movement could in fact be adapted to suit a variety of situations, not simply a block. This of course applies to all the other basic 'blocking' techniques. In fact, consider for a moment the following fundamental techniques: age uke (upper level response), soto uke (outer response), uchi uke (inner response) and gedan uke/barai (lower level response/sweep) or otoshi uke (dropping response). It is certainly no coincidence that these techniques prescribe the gross movements of the limbs in all four general directions using the centre of the body as a source (upwards, downwards, inwards and outwards). Correctly understood kihon training will help us not only to perfect the principles underpinning each movement, but also how to apply power correctly in order to augment these motions. Once this is learned, bunkai (analysis) can be used to apply these motions in many different ways. All of a sudden, the most basic techniques in karate, which are viewed by many as being highly unfeasible in a realistic situation, have become many devastating movements that hold their true strength in their simple, but effective adaptability. Indeed, it would be quite possible to dedicate a whole book on the malleability of these simple techniques alone. In fact, the much-respected Rick Clark has done just that with a single technique in his superb text, '75 down blocks'. This particular work is a fine example of just how much can be gained from the 'proper' understanding of that which you learn. If so much can be gained from only one motion, how much learning do we have in our whole art? "An ordinary onion can be held in a single palm, but within its humble size, it contains many numerous layers. Once we peel a layer from the onion, another one presents itself immediately. The more layers we peel, the closer our goal becomes. It is only when we finally get to the centre, we find that the end is nowhere to be seen, there is no purpose present at all, and in actual fact, the goal was ironically, the removal of the layers themselves." In karate too, we all have layers to peel in order to progress our understanding. Some are physical; some are mental. Some have been and can only be made apparent by many years of correct study. Likewise, some can only be removed by sincere dedicated effort. The goal that we hope to attain will not be (as many of would like to believe) sitting there waiting for us at the end of our journey. For a start off, can we even point to our end? We need to do what we can with full resolve and try to come to understand the very process we take. This will make sure that our goals are never really far away. It's therefore important to learn and teach our art using the principles it contains. The journey itself, the learning of the principles, will enable us to see the attainment of adaptability. By taking the right path, we can ensure that karate is allowed to evolve as it should, is able to 'bend with the winds of adversity' and as a result, the art will surely become personally your own. Master and slave will then become two halves of a single coin. Thanks for your time in reading my thoughts. I hope that you've found them useful.